As the name suggest; we all at Rapture are working with a common objective to bring back the high sprit & complete happiness in the life of patient & its family. 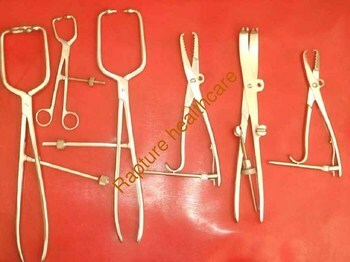 Rapture Healthcare is manufacturer and supplier of the orthopedic implants and instruments such as bone screws, bone plates, etc, which are extensively used in the orthopedic field. To make RAPTURE a world class and quality business solution provider in the field of Orthopaedic implants.. Its endeavor has been to keep up the pace with the rest of the world by providing the latest instruments with a passion towards good quality at a affordable price. Meeting requirements with every order's how so ever big or small, in accordance with individual requirements. Our Company has resourcefulness and capability to meet the demands of customers, in respect of quality, reliability, fast & efficient service. It has the ability to carve a niche for itself in the Global Market through selling and distributing it s vides product range. Being the leading manufacturer and supplier, we always endeavor to provide innovative and high quality surgical Implants. We always prominently ensure that our implants perform well.